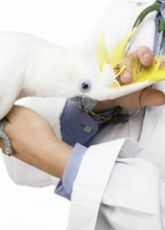 Unlike our larger parrot companions, finches' medical health is much more the owners' responsibility. Even a veterinarian that is willing to see a finch often can't do much more than put the finch down. The lack of finch medical care in the USA is troubling, but from an economic standpoint it is understandable. 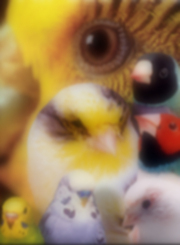 Finches are harder to treat, more frail, hide illness very well, and are very inexpensive to replace. Granted some of the more exotic finches do sell for $200+ but that's still nothing compared to a $1200 Macaw or an $800 Amazon. When a finch breaks a bone your options are very limited. Go ahead and call your local vet. If you are lucky enough to live in the UK or Australia they may even been willing to operate, re-set the bone and splint it. In the USA you are pretty much on your own. I think there are a handful of veterinarians in the states that really know anything about passerine (finch) physiology. The most common reason for a break is trauma. Escaping from a cage and flying directly into the wall causes most bone and soft issue trauma. It makes me cringe just thinking about it. Pet finches that have lived in a small cage their whole lives tend to be less than graceful fliers. They simply lack the experience and muscle tone; this makes they clumsy. When you plan to increase the size of your finch enclosure please introduce the finch slowly to his/her new environment. If you are moving the finches from a small cage in to a large walk in aviary, leave the whole flight cage inside the aviary and prop all the cage doors open. This will allow your finch time to feel comfortable about venturing out. If they are panicked the first instinct is to get away as fast as possible. Another common trauma is getting a leg stuck on an object in the cage or on the cage, usually a nest or in a gap in the cage frame. When trapped by a leg the finch will often thrash itself free. If it's lucky it will only lose a claw and the bleeding will stop quickly. Most finches, however, will break a leg or hip while trying to break free. Not all do get free even after a limb breaks and if you don't find the finch soon enough it will die there. Finally soft bone syndrome / hypocalcemia / calcium deficiency. All three terms mean basically the same thing. While calcium deficiency can lead to egg binding among other health problems in females it can lead to soft bone problems in all finches. This problem is not as easy to spot as most traumatic injuries. What you look for is the finch sitting with its belly on the perch rather than standing up tall. The finch will appear weaker and frailer than a healthy finch. In several cases the legs may even begin to bow out as the weight of the finch's body becomes too much for the legs to support. Because this is a dietary problem you can fix it without any invasive procedure but it will take time for the finch to make a full recovery. 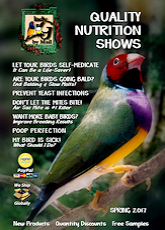 Start giving the finch Calcium Plus daily. If all of your finches are showing signs of soft bones you can treat them all at once. If you only need to treat one finch please move it to a small hospital cage and treat it alone. The Calcium Plus should be given daily for the first month. Then cut back to 3-4 days a week. You can cut back sooner if the finch shows great improvement but don't cut back too fast, the finch may feel stronger quickly but it does take time for the bones to mend fully. If the finch develops problems with balance and coordination stop the Calcium Plus until the symptoms subside, resume a week later and only give the Calcium Plus once a week for a few more weeks. 1. A simple fracture, no major external or blood vessel damage yet still very debilitating and painful. 2. A compound fracture, major damage to the blood vessels, soft issues and the bone usually protrudes through the skin. If the injury is a simple fracture you can call a veterinarian for x-rays and he/she may be able to set and splint the wing. You can move the finch to a small hospital cage and keep it as comfortable and still as possible as the wing heals. Or you can put the finch down. Given the fact most vets won't offer much treatment for finches most people use the hospital cage and rest option. This gives the finch the best chance of survival with the least amount of added stress. Now I must stress that once a wing has been broken it will never be a good as it used to be. Finch bones don't heal that well and the fracture will not heal straight. The finch will always be disabled and may never fly again. This is something you much take in to consideration if you choose not to put the finch down. If the injury is a compound fracture you are very limited in your options. You can call a veterinarian and hope he/she will operate on the finch, or put the finch down. If you wish to have a vet attempt to save your finches' life the wing may have to be amputated. Of course that is if you can get the finch to the vet in time. With an injury this severe the finch will go in to shock from the pain and blood loss and usually die within an hour of the injury occurring. The finch may hang on more than hour if the break didn't cause profuse bleeding. Often you will find yourself with no other option than put the finch down to end its' suffering. Leg fractures tend to be compound breaks. Only because most are caused when the finch thrashes to free itself from something snagging the leg or foot. As with all breaks you are welcome to contact you vet and hopefully you can get professional treatment. For most of you out there you are on your own. You must then decide if you wish you put the finch down or treat it. If you wish to treat you'll need to stop any bleeding first. To do is to grab the finch and use styptic power or baking flour to stop the bleeding. That's right just pour it on the leg in a heap and sit very still for 20 minutes or more while the bleeding stops. If the break is so severe that the lower section of the limb is only attached by a small piece of skin, clip it off. Not easy to do, I know. If the break isn't that bad just stop the bleeding. Don't attempt to splint the leg unless you are experienced, remember the splinting process is very painful for the finch and should only be done by a professional. Once the bleeding has stopped, move the finch to a hospital cage and let it rest. If you wash the leg or remove the clotting agent too soon you will cause pain and the bleeding may resume. Given time and with a lot of loving care the finch may recover and become more active. You won't know how much damage was done to the leg for the first several days. If the blood flow to the lower leg has been stopped the dead leg will eventually turn black and simply fall off. While that is happening the leg will heal and form a small stump. If the dead limb doesn't fall off you can cut it off but only cut the black area and not too close to the viable tissue. Always watch for signs of infection. If the finches' health does deteriorate during those first few days you will need to give serious consideration to putting it down. Sometimes this is the most humane solution. Thankfully most broken legs do heal on their own in time. However as with the wing the leg will never be as it was. The finch will be permanently disabled. When if comes to a hip fracture, you will either put the finch down, or you will care for it. There is no way to splint or repair a broken hip. If the break is too severe the shattered bones can easily tear up internal issues and organs, the finch will die. If the break is simple the leg will never work quite right again but it will heal on its own. As with all broken bones keep the injured finch in a hospital cage until it has recovered and adapted to the new disability. You don't need to do much and don't bother calling your vet. The toe will heal on its' own in time. If the blood supply to the toe below the break has been damaged, the toe will turn black and fall off. If the blood supply is intact, the toe will be forever crooked but it will heal. I am going to add these to this article but only to tell you that either will result in instant paralysis and death. Any time your finch breaks a bone, even if it is as tiny as a toe bone, you should move it to a hospital cage for rest. It's also best to keep it solitary as another finch in the hospital cage may accidentally aggravate the injury, making the whole situation worse. I always use Calcium Plus and Thrive first to treat a broken bone. The Calcium Plus will help with re-calcification of the bone itself and the Thrive will give much needed support to the immune system for faster recovery. If you worry about an infection settling in or the finch is showing signs of illness treat with Amoxycillin for a week. You can give all of these supplements at the same time but it is best to not add the Calcium Plus and Thrive in to the water with Amoxycillin. Use soft foods to give the Calcium Plus and Guardian Angel supplements while administering the Amoxycillin. Once the Amoxycillin treatment has finished you can put both the Calcium Plus and Guardian Angel in the drinking water together. If you injured finch will not eat soft food use the Calcium Plus and Thrive for the first 2 days, then stop them and switch to Amoxycillin if infection is a concern. Please note that infections from a break aren't all that common. Be sure your finch has an infection before giving Amoxycillin. Once the finch is on the med and becoming a little more active use Breeders Blend for extra protein and energy. You can use Breeders Blend, Calcium Plus and Thrive all at the same time.